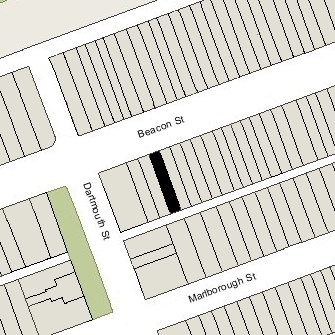 247 Beacon is located on the south side of Beacon, between Clarendon and Dartmouth, with 245 Beacon to the east and 249 Beacon to the west. 247 Beacon was built ca. 1868 for real estate dealer Henry Whitwell, for speculative sale, one of six contiguous houses (241-243-245-247-249-251 Beacon), designed as three matching and symmetrical pairs. 239 Beacon was built at the same time and in the same style; 253 Beacon (since destroyed) also was built at the same time and probably in the same style. On July 25, 1867, Henry Whitwell purchased a 97 foot wide lot from the Commonwealth of Massachusetts. He sold the eastern 19 feet to his brother and business partner, Frederick A. Whitwell (who built 239 Beacon as his home) and retained the remaining 78 feet, which he subdivided into four 19.5 foot lots for 241-247 Beacon. On March 19, 1868, he bought a 60 foot wide lot to the west from Edward S. Rand (who had purchased it on April 27, 1867, from the Commonwealth) and subdivided it into three 20 foot lots for 249-253 Beacon. Click here for an index to the deeds for 247 Beacon. On March 18, 1868, 247 Beacon was purchased from Henry Whitwell by Hannah (Putnam) Bancroft, the widow of Thomas Poynton Bancroft. Her daughter, Ellen Bancroft, and son, Robert Hale Bancroft, an insurance broker, lived with her. They all previously had lived at 9 Chestnut. Hannah Bancroft died in August of 1872. 247 Beacon was inherited by Robert Bancroft and Ellen Bancroft. He retired from business and they traveled to Europe. By 1873, 247 Beacon was the home of Horatio Greenough Curtis and his wife, Annie Neilson (Winthrop) Curtis. They previously had lived at 279 Clarendon. Horatio Curtis was a shipping merchant in the Calcutta trade, and subsequently was a sugar refiner, agent for the Pacific Guano Company, and president of the Old Boston National Bank. The Curtises continued to live at 247 Beacon in 1874, but had moved to 239 Beacon by 1875. By 1875, Robert Bancroft and Ellen Bancroft had resumed living at 247 Beacon. They continued to live there during the 1877-1878 winter season, but then traveled abroad once again. During the 1878-1879 winter season, 247 Beacon was the home of Lyman P. French and his wife, Mary Elizabeth (Fairchild) French. They previously had lived at 38 Chestnut. He was a lawyer and receiver for the West Boston Savings Bank. They continued to live at 247 Beacon during the 1879-1880 season, but moved soon thereafter and by 1882 were living at the Hotel Brunswick (southeast corner of Boylston and Clarendon). By the 1880-1881 winter season, Robert Bancroft and Ellen Bancroft were living at 247 Beacon. During the 1889-1890 winter season, they traveled abroad again and 247 Beacon was the home of Miss Mary A. Tappan. By the next season, she had moved to 44 Beacon. Robert Bancroft married in December of 1891 to Elise (Elsie) Tiffany Milligan. After their marriage, they lived at 247 Beacon and also maintained a home in Beverly. Ellen Bancroft lived with them. In March of 1906, Robert Bancroft purchased 249 Beacon. Robert and Elise Bancroft moved to 249 Beacon and Ellen Bancroft moved with them. On August 26, 1907, Ellen Bancroft transferred her interest in 247 Beacon to her brother as trustee on her behalf. By the 1906-1907 winter season, 247 Beacon was the home of banker Thomas Motley, Jr., and his wife, Margaret (Fay) Motley. They previously had lived in an apartment at 384 Commonwealth. They continued to live at 247 Beacon during the 1910-1911 winter season, but moved soon thereafter to 241 Beacon. After the Motleys moved, Ellen Bancroft made 247 Beacon her home once again. She died in April of 1912. On September 21, 1912, Robert Bancroft transferred 247 Beacon and 249 Beacon to his wife. By 1912-1913 winter season, 247 Beacon was the home of Dr. Charles Galloupe Mixter, a physician and surgeon, and his wife, Helen Worthington (McIntosh) Mixter. They had married in October of 1911 and had lived briefly at 17 Exeter. Prior to their marriage, he had lived at 180 Marlborough with his parents, Dr. Samuel Jason Mixter and Wilhelmina (Galloupe) Mixter. He continued to maintain his medical practice at 180 Marlborough with his father and brother, William Jason Mixter. The Mixters continued to live at 247 Beacon during the 1916-1917 winter season, but moved to 187 Beacon. Robert and Elise Bancroft continued to own 247 Beacon and to live at 249 Beacon. He died in April of 1918. In September of 1917, 247 Beacon became the home of Dr. George Richards Minot and his wife, Marian Linzee (Weld) Minot. They previously had lived in an apartment at 224 Marlborough. He maintained his medical offices with his father, James Jackson Minot, at 188 Marlborough. Dr. Minot was a physician, professor of medicine, and director of Harvard’s Collis P. Huntington Memorial Hospital. He was a pioneer in research on blood diseases and in 1934 received a Nobel Prize for his work with William P. Murphy and George Hoyt Whipple on the treatment of pernicious anemia. The Minots continued to live at 247 Beacon during the 1922-1923 winter season, but moved in the fall of 1923 to 30 Marlborough. During the 1923-1924 winter season, 247 Beacon was the home of banker Henry Parsons King, Jr., and his wife, Mary (Parker) King. They previously had lived at 229 Marlborough, and by the 1924-1925 season, they had moved to 35 Marlborough. During the 1924-1925 winter season, 247 Beacon was the home of Charles Brooks Perkins and his wife, Mary Louise (Floyd) Perkins. He was a tobacco dealer. They previously had lived at The Charlesgate at 535 Beacon, and by the 1925-1926 season had moved to an apartment at 100 Beacon. By the 1925-1926 winter season, 247 Beacon was the home of insurance agent John Paulding Meade and his wife Ada (Wood) Meade. They also maintained a home in Scituate. The Meades continued to live at 247 Beacon in 1931. The house was not listed in the 1932-1935 Blue Books, and was shown as vacant in the 1931-1935 City Directories. On April 15, 1935, 247 Beacon and 249 Beacon were acquired from Elise Bancroft by Mary L. McGill of Somerville. In June of 1935, she filed for (and subsequently received) permission to convert 247 Beacon into a three-family dwelling. She converted 249 Beacon into a lodging house at about the same time. She subsequently was cited by the Building Department for converting 247 Beacon into five (rather than three) apartments without obtaining the necessary permits. 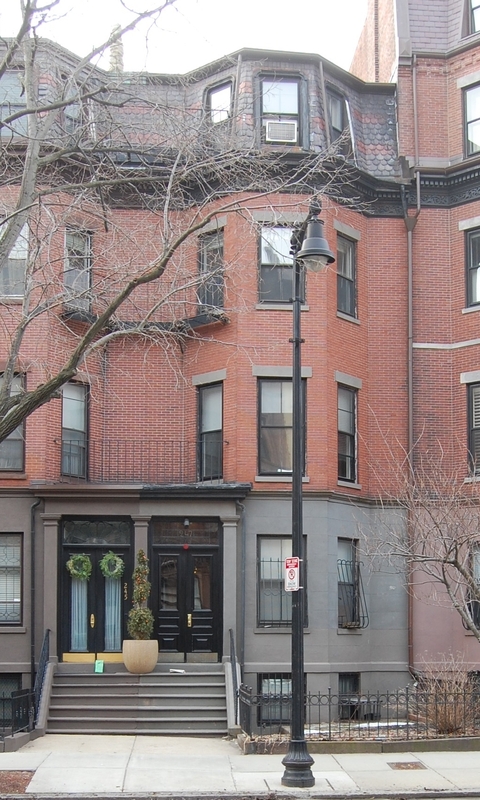 On November 24, 1936, 247 Beacon and 249 Beacon were acquired from Mary McGill by Shirley Clifford Speed, a real estate dealer who converted many Back Bay houses into lodging houses and apartments. He completed the work required by the Building Department to legalize the five apartments at 247 Beacon. By 1938, S. Clifford Speed and his mother, Flora E. (Clifford) Speed, the widow of David George Speed, lived in one of the apartments at 247 Beacon. They previously had lived at 70 Commonwealth. They continued to live at 247 Beacon in 1947, but had moved to 33 Commonwealth by 1948. On June 22, 1948, 247 Beacon was acquired from S. Clifford Speed by Ralph Thomas Hilton, an architect, and his wife, Inez Melissa (Black) Hilton. They lived in one of the apartments. They previously had lived in New York. In April of 1950, he applied for (and subsequently received) permission to remodel the building and increase the number of apartments from five to seven. On May 14, 1954, 247 Beacon was acquired from the Hiltons by Lena (Rubin) Hibel, wife of Abraham B. Hibel, of Brookline. Their daughter, Edna Hibel, became a noted artist. On July 12, 1955, 247 Beacon was acquired from Lena Hibel by Dr. Israel Diamond. A physician, and his wife, Thelma Beatrice (Greenberg) Diamond. The Diamonds lived at 174 Bay State Road with Thelma Diamond’s parents, Dr. Samuel Greenberg, a physician, and Sophie (Levine) Greenberg. 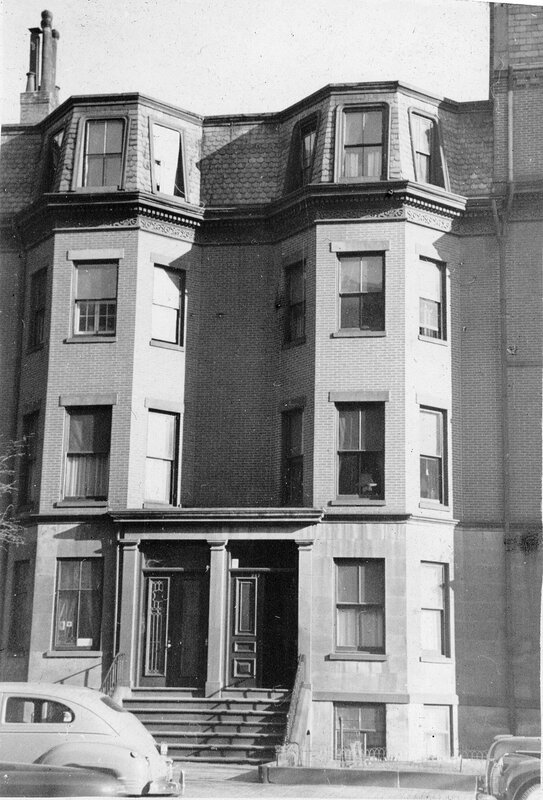 The Hiltons continued to live in an apartment at 247 Beacon in 1957, after which they moved to Salem. On March 28, 1973, Thelma Diamond transferred her interest in 247 Beacon to her husband. At that time, they were living at 54 Brimmer. On June 23, 1982, 247 Beacon was purchased from Israel Diamond by Burton H. Macleod of Sagamore, Massachusetts. On June 12, 1985, 247 Beacon was purchased from Burton Macleod by Burton F. Jaffe, trustee of the 247 Beacon Realty Trust. 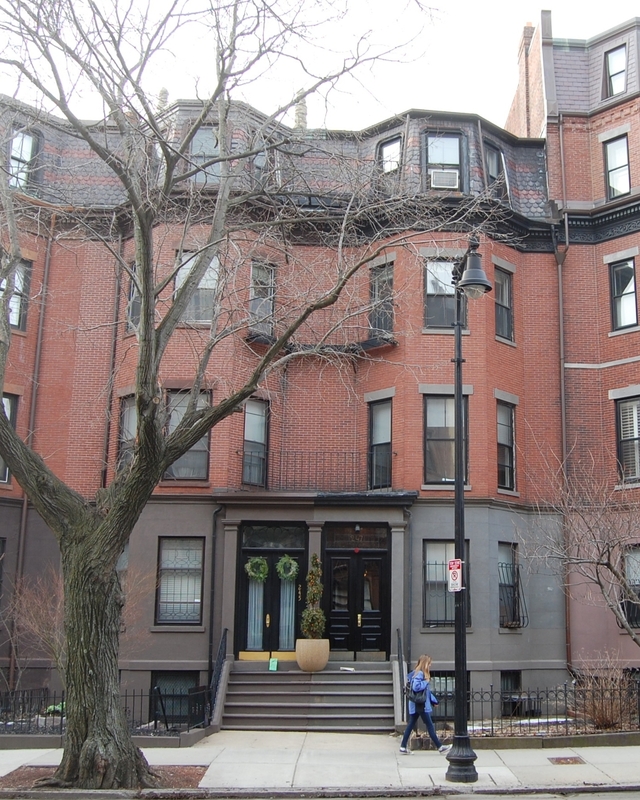 On August 27, 1986, Burton Jaffe converted the property into seven condominium units, the 247 Beacon Street Condominium.